How can teachers and students better protect their online privacy? Student data privacy is a complex issue that can baffle the best of us, but have no fear! There are some simple things any teacher can do to quickly identify and manage online privacy risks, protect student confidentiality, and be more FERPA- and COPPA-compliant. Learn these basic digital citizenship habits and then model them for your students. Do you want to be more mindful about privacy and security but don't know where to start? Our tutorial video and student worksheet show you and your students a few quick, key privacy risk factors to look for on websites. Check out these two great digital citizenship lessons that help students understand the importance of privacy policies and how to analyze websites. Whether you're social media-curious or already using it in your classroom, you've probably wondered about how your social media use affects your students. 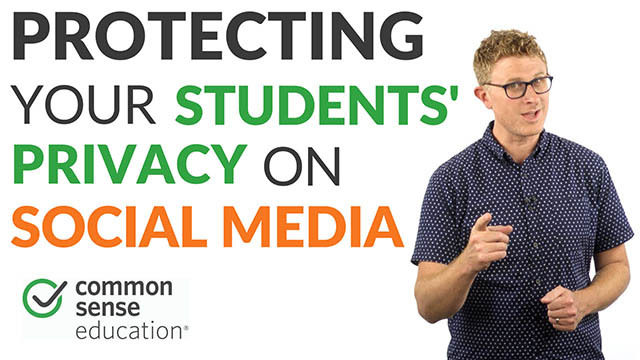 Learn how to share the cool stuff happening in your classroom while protecting students' privacy. These two guides were created by the Electronic Frontier Foundation to help parents and educators set up students' Chromebook and G Suite accounts to protect students' privacy and data. Have students use these privacy settings on their Google accounts. Recommended privacy settings for students' Chromebooks. Ready to be more vigilant when it comes to privacy? Use our in-depth privacy evaluations to look into tools you're using or thinking about using, and then read about actions you can take and tools you can use to safeguard you and your students. Explore our in-depth privacy evaluations of 100+ popular edtech tools. Ready to protect your privacy daily? Here are some tools to try and simple steps to take.